BPBible is a flexible Bible Study tool made using the SWORD project, Python and wxPython. It is absolutely free and designed to be easy to use. Find the latest release here, and more documentation on our wiki. The main BPBible window when changing the currently selected Bible. For more screenshots, see here. 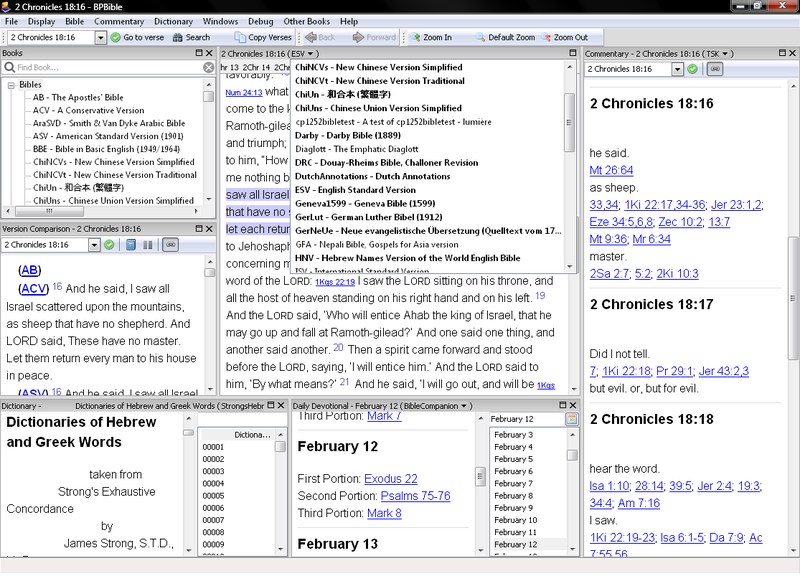 Bible application: BPBible has many of the features you would expect in a Bible application - Bible, Commentary, and Dictionary support, Bible Search, Scripture tooltips, etc. Cross verse searching: BPBible uses a proximity based search, rather than a verse-based search. This means that a search can cross verse boundaries, giving a more natural search. It also supports regular expressions and phrases. More info. Flexible layout: BPBible lets you rearrange your layout, and will remember your layout for you. Good module support: Due to the use of the SWORD libraries, BPBible can read many different Bibles and other books. The main module repository is hosted by CrossWire. More info on how to install these books in BPBible. User Notes and Topic Management: BPBible supports taking notes on a passage, as well as collecting all the passages related to a topic into a list and then organising and commenting on those passages. More info. Free: BPBible is licensed under the GPL (version 2) and is absolutely free. Uses open source technology: BPBible uses open source technology including Python, wxPython and the SWORD project.